Each generation in our society has a unique perspective and acts in a different way based on lifestyles and societal changes experienced while growing up. These differences influence the work habits and values of employees of an office, which can pose challenges for business owners and managers who gravitate towards a uniform leadership style. But instead of fearing generational differences, it is beneficial to keep all forms of communication channels open to building strong relationships between coworkers and management. Workplace diversity is an asset, and certain characteristics of organizational culture make the most of this asset. Here are some ideas about how to create a work environment that embraces all generations equally, from Baby Boomers to Generation Z workers and everyone in between. Many people wonder exactly “What is work culture?” and whether this ideology really matters in practice. Work culture embodies the beliefs and attitudes of a company’s employees and owners. It describes the overall vibe of an organization and influences how employees interact with each other on a daily basis. With a positive and productive work culture, employees are supportive of each other, participate in important discussions, are treated fairly, and engage in team-building activities. Without work culture, a business won’t retain engaged employees for the long-term, attract new candidates that work well with existing employees, or help employees at all levels feel happy and satisfied with their jobs. The importance of work culture is often even more significant in business that employs people from multiple generations. However, every employee deserves to be judged only by the work they do and valued on a personal and professional level without unfair stereotypes getting in the way. Employees from different generations can learn a lot from each other in terms of work habits, communication styles, and conflict resolution strategies. By establishing a welcoming and inclusive culture that allows all employees to speak their minds and focuses on commonalities, a business can thrive in unexpected and exciting ways. Baby Boomers (people born between 1946 and 1964) are known to be well-educated, have great teamwork skills, and thrive on assignments that require a certain amount of adrenaline and pressure. These individuals are sometimes referred to as the “Woodstock Generation,” with ideas and beliefs that have been influenced by post-war social change, the Vietnam War, and the Civil Rights Movement. Generally, Baby Boomers are motivated by monetary rewards, higher levels of responsibility, and retirement perks. But they don’t necessarily require constant feedback or praise to get a job done right. Generation X individuals (born between 1965 and 1980) are known to be hardworking, responsible, independent, and focused on their families. Sometimes called the “Latchkey Generation,” many Generation Xers come from families with detached or divorced parents and reject bureaucratic red tape on the job. Generation X workers value work-life balance and are credited with invigorating the entrepreneurial spirit in our society. In the workplace, Gen Xers are often motivated by bonuses, gift cards, telecommuting options, and other flexible schedule offerings. Millennials, also known as “Generation Y” or the “Entitled Generation,” are often the most talked about generation of our current time and born between 1981 and 1995. Many Millennials are the products of doting parents and grew up getting to know exciting forms of technology as they first developed. In the workplace, Millennials are thought to be very social, tech-savvy, and demand a healthy work-life balance. These workers value culture very much in a business and thrive with proper training, mentoring, and feedback systems in place. Young employees born after 1995 are typically lumped together into the category of Generation Z, sometimes called the Linksters or the “Facebook Crowd.” These individuals grew up surrounded by technology from an early age and are often highly dependent upon technology in daily life. Generation Z workers often value social activism, eco-friendly causes, and alternative lifestyles as well. In the workplace, many Gen Z workers thrive when given constant feedback, social rewards, and flexible schedule offerings. Increasingly, these young workers are preferring face-to-face communications as an apparent backlash against the virtual conversations that they grew up with and that have driven modern workplace environments for many years. Of course, all of these observations are generalizations, and each employee is unique regardless of age or generation identification. But there are certain characteristics of organizational culture that bridge gaps between generations and create desirable work environments for all employees. Since communication barriers are what most often result in inter-generation conflict, companies should make communications available in multiple formats. For example, a manager can communicate a new policy change in an email as well as in an in-person meeting, offering to discuss the change further via face-to-face meeting or instant messaging if desired. Mentoring is another common characteristic of organizational culture that helps multiple generations meet in the middle in a mutually agreeable way. By pairing younger workers with older workers, you can help teams spark new ideas and build upon the strengths of each individual. An organizational culture that commands respect and values diversity can help all employees find their place in a work environment regardless of age or background. 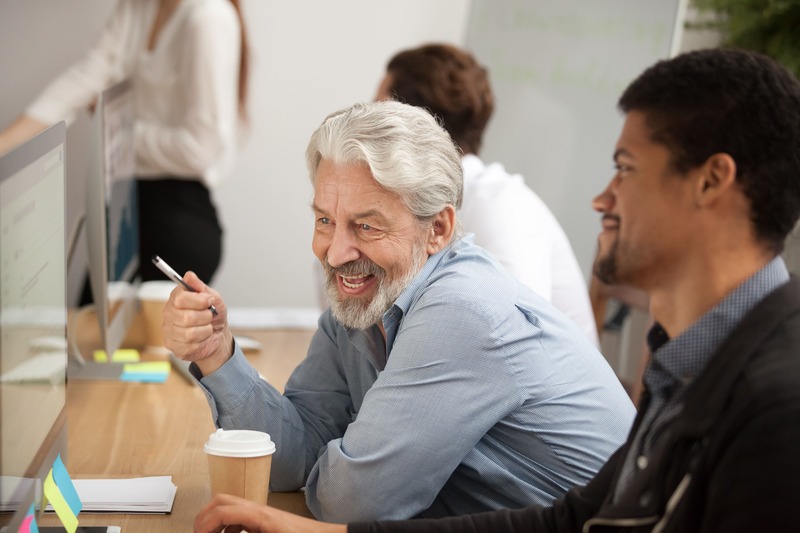 Furthermore, companies of all shapes and styles and in all industries can benefit from age diversity training so that all employees can understand the myths that surround common stereotypes and begin to see beyond them. It’s important to solicit feedback from employees from each age group to identify gaps in workplace balance and opportunities for improvement. Open and honest conversations conducted through multiple communication mediums can reveal how a company can make better use of technology, improve work ethic, and promote work-life balance. Regardless of what age group someone belongs to, everyone wants to feel appreciated, valued, and respected at work. However, the modern company is no place for a one-size-fits-all approach to employee rewards and compensation. Employees may be more excited and enticed by a certain rewards system based upon their generation, so consider giving employees options for the types of rewards they’d like to receive. For example, employees who meet their monthly goals can be presented with options for extra vacation days, flexible work hours, professional development opportunities, or a combination of the three options. With multiple reward options in place, companies can motivate their employees to take their skills to the next level for the benefit of everyone. Since each generation works a bit differently, companies also find success in giving employees more freedom with how and where they work. While Baby Boomers may feel more comfortable working in the company’s home office, younger workers may benefit from working from home, at a coworking space, or temporary office space for meetings and collaborative work. For example, NYC Office Suites offers companies employing multiple generations of workers with the best of both worlds. With flexible-term offices and meeting rooms available when you need them but not when you don’t, business owners can cater to the needs of all generations for harmonious operations and greater productivity.